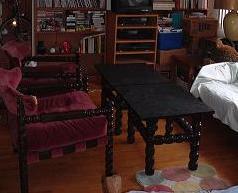 CHESTNUT CLEANING SERVICES - CHICAGO - CLUTTER is ... and CHAOS is ... our specialty! CLUTTER is ... and CHAOS is ... our specialty! purchasing yet another item you know you already have but cannot find? dreading going home to "that" and of being unhappy about the mess? We can organize your environment with your direct assistance throughout this process. As possibly one of our Special Needs clients, for an additional cost and with the client's help, guidance, and involvement during the entire process, we can organize your home (which you possibly haven't allowed anyone to enter in a long time) and then clean it (because it probably needs cleaning as well). Most organizing services don't clean and most cleaning services don't organize. WE DO BOTH AND AT THE SAME TIME! Once this process concludes (and only with the client's help), the client has the option of having us come back on a regular basis and maintain their home. And unlike some "organizing" services, we do not want you to buy anything: closet organizer units, shelving units, etc., we just utilize what you already have to keep your costs down. If the client who needs organizing wants us to do so: First, we organize the open spaces areas that typically have "trails," and pathways. These clients frequently have many duplicate purchases: cleaning supplies, clothes with the tags still on them. These clothes (as well as the client's clothes that no longer fit) need to be sorted and consolidated. Second, we can organize all the closets and third, we can organize all of the drawers: kitchen, dining room buffet, bedroom, etc. 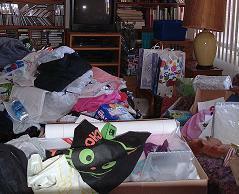 Although some people often describe these "clutter" conditions as hoarding, pack rat, etc., we describe these conditions as "depression" cleaning, for our experience has been that this condition has gone on for months or years in the client's home, resulting in, for example, situations in which repair people are not being invited in to fix broken faucets or toilets, friends and relatives are not being invited over, etc. The "depressions" that we call this home-life condition of chaos is possibly the cause of the "depression" or the result of the "depression". In either case, the home dweller very often dreads going home to this. Click to read more about Clutter.